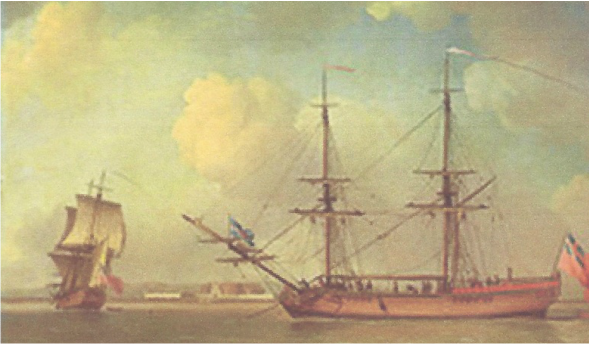 View of two snow rigged vessels of the type commanded by Hugh Percy that brought Hans Adam Büdinger with his wife and family to America in 1737. Painting by Charles Brooking (1759). 1. i. Johann Nicolas Bütttinger (Nicholas Bittinger), born 11 Jun 1725.
ii. Joseph Adam Büttinger, born 03 Aug 1727 and died 15 Apr 1728. 2. iii. Johann Henricus Büttinger (Henry Bedinger), born 23 Mar 1728/29. Johann Adam Büttinger and his family immigrated to America in 1737 and settled in York Co., Pennsylvania. All males arriving at Philadelphia were required to pledge allegiance to the British Crown. Johann Adam signed his name “Hans Adam Büdinger” which was to become his name in his new country. In the court records of York County, Berwick Township,Pennsylvania his name is recorded as "Adam Beetinger". (ai) When his children reached maturity, they customarily changed their names in an English manner. In so doing, they dropped the first name, which was traditionally the name of a saint, and anglicized the middle and last names. Johann Nicolas became known as Nicholas Bittinger. Johann Henricus and Johann Peter anglicized their last name to Bedinger and became known as Henry Bedinger and Peter Bedinger. vi. Eva Büdinger (Eva Bedinger), born about. 1751.
vii. Marillas Büdinger (Marie Elizabeth), born between 1751 and 1754.
viii. George Adam Büdinger (Adam Bedinger), born 07 Dec 1754. 4. ix. Christian Büdinger (Christopher Bedinger), born about 1757.
x. Frederick Büdinger", born about 1759. The bold Arabic numerals in the chart above indicate those children of Hans Adam Büdinger for whom descendants are known. The descendants of the four children of Hans Adam Büdinger, listed above, are known to some extent and with varying degrees of confidence. The families of some have been published. Some are privately published. Some unpublished and of very limited distribution and availability. The classic genealogy is that of Lucy Forney Bittinger, published in 1904 , entitled "Bittinger and Bedinger Families Descendants of Adam Bedinger". The descendants of George Michael Bedinger (1756-1843), son of Henry Bedinger1, above, was compiled by Danske Dandridge and published in her book, "George Michael Bedinger A Kentucky Pioneer", published in 1909. An extensive compilation of the descendants of Philip H. Biddinger by LaVerne Biddinger Snyder entitled, "Philip Biddinger Genealogy" was published in 1981. Philip H. Biddinger was a grandson of Peter Bedinger3, above. The internet has provided a medium for wide distribution of genealogical compilations. Genealogical information for each of the four children noted above can be found on the internet. I would mention two internet sites that can be accessed, Rootsweb's WorldConnect and Ancestry.com. A genealogy of descendants of Hans Adam Büdinger has been posted by Norris Alford at Rootsweb's Worldconnect. The advantages of the internet for genealogical research are immense, but not without serious drawbacks. Most of the compilations are without sufficient documentation providing a researcher with the dilemma of judging whether to accept the information without further research. Many of the compilations found on the internet are simply copies from other compilations resulting in a plethora of documents of uncertain value among the few reliable compilations. Being the host of this website and a descendant of Henry Bedinger2, above, this website is devoted mostly to the descendants of Henry Bedinger2. I have recently begun to accumulate family information on the other children of Hans Adam Büdinger with encouragement, assistance and information generously given me by Dorothea Bedinger Clymer. I have endeavored to post on this page the most reliable information now available. It is my hope that it will interest to other Bedinger descendants and the research will be continued. I have posted, below, my compilation of descendants of Henry Bedinger. Below is a link to the first four generations of Henry Bedinger's descendants. Revisions and collection of data on additional generations are in progress to be posted here. [a] Dr. Emmert F. Bittinger discovered, through the Cerce Genealogique d'Alsace in Strasburg, the ancestral villages in Alsace, Ottwiller and Durstel, where Hans Adam Büdinger and other family members were born and married. Dr. Bittinger obtained copies of the church records from the Alsatian villages. The English transcriptions of these records are from Mr. Allonas Thierry of Strasbourg of the archives from the Cerce Genealogical d'Alsace. These records are considered to be the reliable standard for the family history and genealogy. Dr. Bittinger's report of his findings in Alsace is given here in "Ancestral villages of Büdinger Family in Alsace." Hans Adam Büdinger's wife was the daughter of Johan Schusch and Margaretha Hatt. Her first marriage was to Johann Georges Hausknecht. Hausknecht is the preferred spelling conforming to the transcription of the original records of the protestant church in Durstel. [ai] York County, Pennsylvania, Index to Deeds, records the transfer of property in Berwick Township from Johannes Shawman and wife to Adam Beetinger, recorded in Vol. A, Page 381, Feb 6 1760. Berwick Township is now in Adams County, Pennsylvania. [aii] The genealogy of Dorothea Bedinger Clymer gives Sabina's surname as "Stroud". [b] Court records of York County, Pennsylvania settling the estate of Hans Adam Bedinger refer a widow of Hans Adam, named Philipin. Without further information or clarification, this is contrary to documents relating to Sabina and are not considered reliable. The third wife, named Sabina, who survived Hans Adam. We reference the following court records from the autobiography of David Everett Bedinger and the statements in the biography of George Michael Bedinger by Danske Dandridge stating that Sabina was the third wife of Hans Adam and was his surviving widow. [c] Hans Adam Büdinger was married three times as supported by the statement given in Dandridge's biography of George Michael Bedinger, p. 31, "... and the young Christian [Christopher] Bedinger who was the son of Adam Büdinger by his third wife, and consequently a half-uncle of George Michael Bedinger, ...”. Bittinger, Adam - September 1, 1768 - Berwick Township - 192 A tract. ​Widow, Sabina. Children: Nicholas, Henry, Michael, Peter, Marillas, George, Adam, Christian, Frederick, and Eva. Will B227 - September 7, 1769 - Philipin - a widow of Adam Bittinger, renounced right of Admr on May 22, 177?. Nicholas Bittinger made Admr of Adam Bittinger estate. OC - 13 - 225. March 8, 1770, Nicholas Bittinger, admr submits 60/f 62-2-10. OC/C 19-20. May 29, 1771. Nicholas, eldest son takes homestead at valuation of 231-16, and to pay widow Sabina a dower during life of f 3-7-1 on April 29; Nicholas to keep 29-18-1 and pay other children, Henry and others (see above) each f 11-4-3-1/2 now and at death of widow f3-14-9. [f] The Bedinger genealogical charts are from the report: Clymer, Dorothea Bedinger, 1991, Index to Bittinger and Bedinger Families: Descendants of Adam Büdinger for the Library at Memorial Continental Hall, D. A. R. and The Descendants of Pvt. Christopher Bedinger, 1st Pennsylvania Regiment, Continental Line, privately published. The chart for the family of Christopher/Christian Bedinger include revisions to incorporate subsequent research. Hans Adam's second wife is given as "Anna Maria Magdalena" in many genealogical compilations. Dorothea Bedinger Clymer points out that "Anna Maria Magdalena" is the wife of Adam Bedinger, not his father Hans Adam Budinger, which a careful reading of Bittinger (1904), p. 8 will reveal. [g] Bedinger descendants are entered in descendant chart in NGS Quarterly, Descendant Ordered format from the master data base which is stored in Family Tree Maker published by Broderbund Software. This is the preferred format of the National Genealogical Society. The Bedinger descendants in this section are the descendants of Hans Adam Büdinger. The format allows for a chart for each child of Hans Adam Büdinger for whom descendants are known and compiled for presentation. Currently, only the descendant chart for Henry Bedinger, Hans Adam's third son, is the only chart presented here. Additional charts will be added as they are compiled for presentation. Each descendant in the NGS descendant chart is assigned an Arabic numeral. In the descendant chart of Henry Bedinger, the first individual in the chart, is assigned number one, i. e., Henry Bedinger(1). The NGS number may be used within the text of the website to identify Bedinger descendants by which he or she can be found in the genealogical tables. For example, Henry Bedinger (1753-1843), the son of Henry Bedinger(1) has the NGS number (4) and is identified as Henry Bedinger(4). When descendant charts of other children of Hans Adam Büdinger are presented, a Roman prefix number will precede the NGS number.